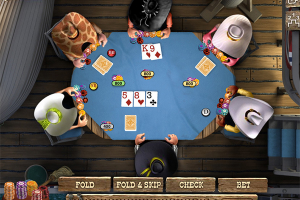 "The successor of the Governor of Poker video game"
Elsewhere on Winportal we presented an article about the demo version of the video game belonging to the cards category, called Governor of Poker, which got the title “Play Texas Hold’em Poker in the wild west”. Now, here we present the successor of this game from YoudaGames, called Governor of Poker 2 Premium. The download contains the demo version for the Windows platform, but it is also available on Google Play for those among you counting with an Android smartphone or tablet. Now, in Governor of Poker 2 Premium you’ll need to fight the new ban the Texas government is about to put on the poker game. Now, the aim is to prevent this, fighting it by advancing to become the most notorious poker player in the state. New tournaments, bounty hunter games, challenging players, more than two dozens of poker locations, and more you can find out about proceeding to this demo download.